Baby boomers are no longer the largest American generation. But they’re still one of the strongest, armed with skills and experience to help them live fully. One area where older Americans are thriving? Small business! In 1996, people 55 to 64 made up less than 15 percent of new entrepreneurs. In 2016, that same age group made up 25 percent of new entrepreneurs, according to a study by the Kauffman Foundation. We call them encore entrepreneurs. Many are starting businesses for the first time as they near retirement age. Some are already retired, but seek a new path to help them feel reinvigorated in their older years. It’s the ultimate example of age being just a number. Consider Ryders Public Safety. Two law-enforcement officers nearing retirement started this shop to serve the Denver, Colorado area because they knew they could serve security industry customers better than current offerings. One of the owners’ wives has joined the team to support the shop as it expands into ecommerce. Meanwhile, Laurie Brown pivoted from her 30-year career in corporate management to a gift-basket delivery service. Her business idea meshed with her passion for helping people with special needs, who create and fill baskets as a part of their job-skills training. These are just two examples of seasoned professionals taking an idea and turning it into an encore career as an entrepreneur. Before embarking on a business journey in your 50s, 60s, or beyond, consider your reasons for doing so. Is it a method of ensuring financial stability? Is it a way to make extra money while practicing a skill you value? There’s no wrong answer, but knowing your “why” will undoubtedly help guide you as you prepare to pursue your small business idea. You’ll be able to right-size your business to your goals. Too much planning can stall even the brightest of business ideas. If you’re balking at the idea of writing a business plan from scratch, consider a lean startup plan. Methods like the Business Model Canvas and Lean Canvas model can help you test the viability of your business idea on a brief worksheet rather than a lengthy plan. You can even take your business model canvas with you to initial financing discussions to help illustrate your business idea and your plans. If you decide to move forward with your idea and write a full business plan, your one-page worksheet will help you get started. Some SCORE chapters host in-person events about lean business planning; you can also view a free recorded webinar that walks you through the process online. 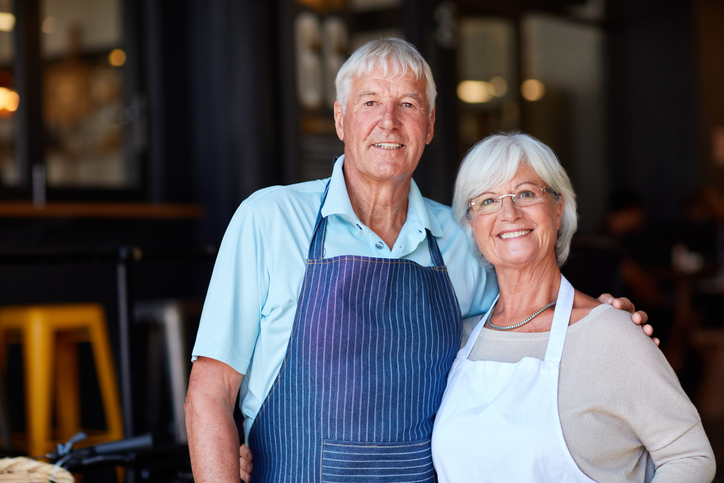 Emergencies can happen to any business owner, but health can be a special consideration for older business owners. Make plans to take care of yourself as you launch your business with a solid work-life balance. Just as you strategize for business success, you’ll also plan for your own longevity in your business — whether that means keeping a schedule that works for you, or hiring staff who can keep your business humming if you need to take a break. A mentor may bring to mind an image of an older person, experienced and wise. Guess what? That might be you! But you still need someone to guide your new small business. You may find that your perfect mentoring is the same age as you. Or, they might be half your age. Go into your mentoring relationship with an open mind. Regardless of age, a mentor will challenge you to think strategically while cheering you on along the way. Remember that small business expertise comes in many forms! Are you ready to become an encore entrepreneur? Meet with a SCORE mentor to get started.